Memory disturbances (*attention *concentration *brain fatigue syndrome) Behavior disorder (*Asocial behaviour *Aggressive behaviour) Mental retardation, Anxiety, Depression, Stress and tension headache. Box of 10 blister strip contain 10 capsule each 8 Pack of 200 ml. 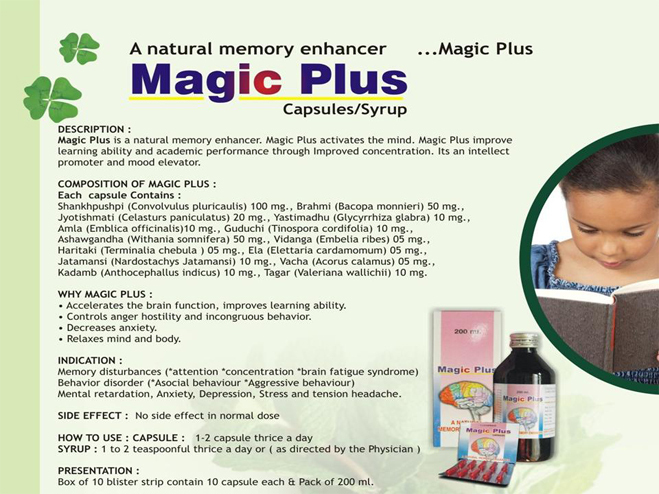 Magic Plus is a natural memory enhancer. Magic Plus activates the mind. 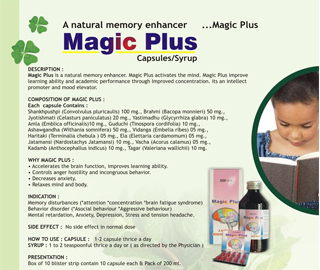 Magic Plus improve learning ability and academic performance through Improved concentration. Its an intellect promoter and mood elevator. Each capsule Contains : Shankhpushpi (Convolvulus pluricaulis) 100 mg., Brahmi (Bacopa monnieri) 50 mg., Jyotishmati (Celasturs paniculatus) 20 mg., Yastimadhu (Glycyrrhiza glabra) 10 mg., Amla (Emblica officinalis)10 mg., Guduchi (Tinospora cordifolia) 10 mg., Ashawgandha (Withania somnifera) 50 mg., Vidanga (Embelia ribes) 05 mg., Haritaki (Terminalia chebula ) 50 mg., Ela (Elettaria cardamomum) 05 mg., Jatamansi (Nardostachys Jatamansi) 10 mg., Vacha (Acorus calamus) 05 mg., Kadamb (Anthocephallus indicus) 10 mg., Tagar (Valeriana wallichii) 10 mg. Accelerates the brain function, improves learning ability. Controls anger hostility and incongruous behavior.